After less than seven years, however, Hatshepsut took the unprecedented step of assuming the title and full powers of a pharaoh herself, becoming co-ruler of Egypt with Thutmose III. Though past Egyptologists held that it was merely the queen’s ambition that drove her, more recent scholars have suggested that the move might have been due to a political crisis, such as a threat from another branch of the royal family, and that Hatshepsut may have been acting to save the throne for her stepson. Knowing that her power grab was highly controversial, Hatshepsut fought to defend its legitimacy, pointing to her royal lineage and claiming that her father had appointed her his successor. She sought to reinvent her image, and in statues and paintings of that time, she ordered that she be portrayed as a male pharaoh, with a beard and large muscles. In other images, however, she appeared in traditional female regalia. 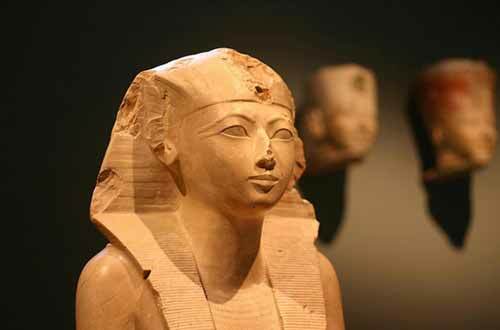 Hatshepsut surrounded herself with supporters in key positions in government, including Senenmut, her chief minister. 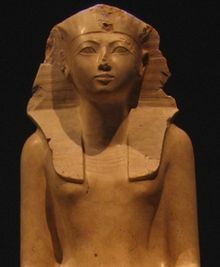 Some have suggested Senenmut might also have been Hatshepsut’s lover, but little evidence exists to support this claim. As pharaoh, Hatshepsut undertook ambitious building projects, particularly in the area around Thebes. Her greatest achievement was the enormous memorial temple at Deir el-Bahri, considered one of the architectural wonders of ancient Egypt. Another great achievement of her reign was a trading expedition she authorized that brought back vast riches–including ivory, ebony, gold, leopard skins and incense–to Egypt from a distant land known as Punt (possibly modern-day Eritrea). Hatshepsut probably died around 1458 B.C., when she would have been in her mid-40s. She was buried in the Valley of the Kings, located in the hills behind Deir el-Bahri. In another effort to legitimize her reign, she had her father’s sarcophagus reburied in her tomb so they could lie together in death. Thutmose III went on to rule for 30 more years, proving to be both an ambitious builder like his stepmother and a great warrior. Late in his reign, Thutmose III had almost all of the evidence of Hatshepsut’s rule–including the images of her as king on the temples and monuments she had built–eradicated, possibly to erase her example as a powerful female ruler, or to close the gap in the dynasty’s line of male succession. As a consequence, scholars of ancient Egypt knew little of Hatshepsut’s existence until 1822, when they were able to decode and read the hieroglyphics on the walls of Deir el-Bahri. In 1903, the British archeologist Howard Carter discovered Hatshepsut’s sarcophagus (one of three that she had prepared) but it was empty, like nearly all of the tombs in the Valley of the Kings. After launching a new search in 2005, a team of archaeologists discovered her mummy in 2007; it is now housed in the Egyptian Museum in Cairo.